A data model is a logic organization of the real world objects (entities), constraints put on them, and the relationships that exits among objects. You can see a DB language as a concrete syntax for a data model. Data model is implemented by a DB system. Any real world entity is uniformly modeled as an object. They are attached with a unique id which is used to refer the object to retrieve. You can see an object retaining its identity even if some or all of the values of variables or definitions of methods change over time. This concept of object identity is necessary in applications but does not apply to tuples of a relational database. It is a stronger notion of identity than typically found in programming languages or in data models not based on object orientation. · Value: A data value is used for identity. For example. the primary key of a tuple in a relational database. · Name: A user-supplied name is used for identity. For example, file name in a file system. · Built-in: A notion of identity is built-into the data model or programming languages and no user-supplied identifier is required. For example, in OO systems. There are many situations which avail the benefits of generating the identifiers automatically which help in becoming human independent of performing the task. Complex objects: Complex objects are those that are form from the simpler objects by applying methods to them. Examples of simpler objects may be integers, characters, strings of any length, Booleans (0/1), floating point values, etc. examples of methods or constructor can be Set, List, tuples, etc. You can differentiate complex objects as structured objects and unstructured objects. Structured complex object are component and is defined by applying type constructor recursively at different levels. For example consider the object DEPARTMENT object. The figure 15.1 shows the diagrammatic representation of the structured complex object for the object DEPARTMENT. 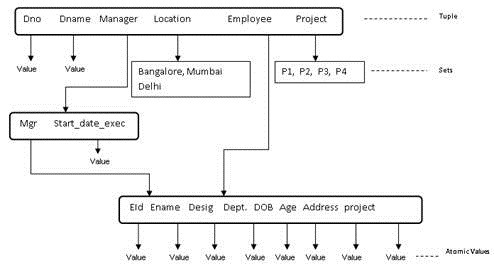 In the first level the DEPARTMENT has a tuple structure with six attributes (Dno, Dname, Manager, Location, Employee, and Project). You can observe that out of these attributes Dno and Dname have basic values; the other four have complex structure. Therefore you need to build second level of the complex object structure. You can also observe that out of these four Manager and Employee has tuple structure and the other two (Location, Projects) have set attributes. For the third level the manager has one basic attribute for start_date_exec and Mgr is a attribute which refers to employee object and has a tuple structure. For Location and Projects we have set of tuple structured objects. Thus, it is used to represent the object and its hierarchy in a structured form. Unstructured components are data types that are stored on large data storage. This kind of complex object is used to represent image or large text. For example the objects which are two dimensional images and if we need that any application needs to select from the collection of those images which are of similar pattern then the user must provide the pattern which is recognized. Here pattern recognition is a different field of study in itself which may help in studying the different patterns and building relationship between the patterns. You can create any object by executing some applications program, by invoking the object constructor operations. Not all objects are meant to be stored permanently in the database. Object persistence, is the term you often hear used in conjunction with the issue of storing objects in databases. Persistence is expected to operate with transactional integrity, and as such it is subject to strict conditions. In contrast, language services offered through standard language libraries and packages are often free from transactional constraints. The typical mechanisms for making an object persistent are naming and reliability. The naming mechanism involves giving an object a unique persistent name through which it can be retrieved by this and other programs. But sometimes it is not practical to give names to all objects in a large database that includes thousands of objects, so most objects are made persistent by using the second mechanism called reachability. The reachability mechanism works by making the object reachable from some persistent object. In the EMPLOYEE type, you can implement Emp_Id, Name, Address, department, DOB, Phne_no functions as stored attributes, and the age function as a method that calculates the age from the value given in the DOB attribute and current date. Class is a means of grouping all the objects which share the same set of attributes and methods. An object must belong to only one class as an instance of that class (instance-of relationship). A class is similar to an abstract data type. A class may also be primitive (no attributes), e.g., integer, string, Boolean. Class hierarchies derive a new class (subclass) from an existing class (superclass). The subclass inherits all the attributes and methods of the existing class and may have additional attributes and methods. Inheritance is a way to define relationships among objects. As the name indicates inheritance tells us that an object is able to inherit characteristics from another object. In more detail we can say an object is capable of acquiring the state and behavior of its parent object. The objects will have common behaviors so that inheritance works. For example, suppose we would like to create a class called “Human” which would represent the physical characteristics. It is a generic class that would represent you me and anyone other human in the world. It has state that takes of having legs, arms, etc. They can eat, sleep, drink, and walk. In that way, human is capable of acquiring behaviors, that resembles all of us same. But when it comes to specific of being gender it is not the same. So another two new class types need to create “man” and woman”. The state and behavior of the human will now depend upon these two classes. The human will differ from each other based on these two types and may be combination of two classes. Therefore, inheritance allows us to encompass the state and behavior of parent class to child. The child class is treated as the specialized version of its parent. 1. It is an abstraction mechanism which may be used to classify entities. 2. It is a reuse mechanism at both the design and the programming level. 3. The inheritance graph is source of organizational knowledge about domains and systems. Object oriented databases are also called Object oriented database management system (ODBMS). These databases store objects rather than storing data such as integers, strings and real numbers. An object has attributes and methods. As you know attributes are data that defines the characteristics of object, it store integers, strings etc. Methods define the behavior of the objects. They are also called as procedures. If we ask ourselves when to use objects databases, then the answer is whenever you need to store complex databases or relationships then we can use ODs. While the relational database stores the data about the object, ODs store the objects. in this way it avoids more processing methods for understanding the object. For example if you have to store the image of the dog in a relational database then you need to store the different parts of the dog in the table. The following table may be the representation of storing the image of dog in the relational database. If the same thing has to be stored in ODBMS, it is the object DOG which is the combination of many attributes and methods. 1. CAD applications: This kind of storing the data helps in storing the complex data types. types in the same database. 3. Evolutionary applications: Using ODBMS it becomes easier to follow objects through time. In early 1950s the data was stored in files and this was the first method of recording the data for processing and future process. This method was called File processing systems. In this kind of systems data was stored after the process created it has ceased to exist. Gradually files were replaced by tree structure in 1960. The structure allows repeating information using parent/child relationships: each parent can have many children but each child only has one parent. All attributes of a specific record are listed under an entity type. During 1970s, relational DBMS was introduced which work on relationship that exists between the entities. They show more reliable property, more flexible, less redundant and multiple views of same data. Consider an example of Student_Course relationship. The entity STUDENT has got attributes std_id, std_name and std_address. The following will be the table for STUDENT database. The relationship between the STUDENT and COURSE is identified by the relation OPTED. Therefore the relationship database has Std_id and course_id as its attributes. Ø Go to OPTED and look up student with id MBA2005 and return the course_id. This process is called Navigation. You should note that the process relies on pointers and for this reason pointers must be persistent. When this system was first initiated the querying varied considerably. But due to the existence of object oriented language (OOL), It has become normalized. To implement a stored procedure, the behavior must be described in the object model and implemented in the run time implementation of the object model behavior. Likewise, referential integrity traditionally supported through triggers or declarative constructs in the relational world, must be described in the object model and implemented in the runtime. The theoretical problem with this is that such things as database rules must be consistently implemented in each application, as opposed to once in the DBMS with most RDBMS and ERDBMS products. If this separation is not managed inconsistencies can arise in the database. The most important factors which is responsible are the following Persistence: This is that property of object oriented a database which gives objects persistence. This allows the objects to be stored between database runs. This also helps in versioning which means a new object is created every time changes are made. Sharing: objects can be shared in the distributed environment. Objects can be shared between processes where ever required. This is possible with object oriented databases. There are four different kinds of standard relationships which object oriented databases models. 1. Inheritance: this kind of relationship is used when one object is a kind of something else. For example, Son looks like his father. 3. Aggregation: this kind of relationships is used when one object is made out of other objects. For example, human body is made out of different organs. is part of another object. For example, Stomach is part of human body. · Objects don’t require assembly and disassembly saving coding time and execution time to assemble or disassemble objects. · Better concurrency control – A hierarchy of objects may be locked. · Data model is based on the real world. · Less code required when applications are object oriented. In spite of much advantage we have from ODBMS there are many drawbacks. · Lower efficiency when data is simple and relationships are simple. · Relational tables are simpler. · Reduced access speed due to late binding. · More user tools exist for RDBMS. · Support for RDBMS is more certain and change is less likely to be required. Object Relational database management systems simply ORDBMS is a system that implement object oriented front end on a relational database. It acts as a interface when the other applications interact with this database. It will behave as though the data is stored as objects. The information which is in the form of objects is converted into database. ORDBMS converts data between an object oriented format and RDBMS format. Therefore, the speed performance of the database is degraded substantially. This is due to the additional conversion work the database must do.